Come to Casa Amor - House of Love! Upgraded, gorgeous 2 bedroom, 2 bathroom OCEANFRONT condo located just 10 minutes from downtown Puerto Vallarta. Again, you're right on the ocean! Very quiet complex surrounded by the tropical jungle and mountains. Nothing enhances the sound of the ocean filling Casa Amor like the colorful surroundings! Beautiful rattan furniture, WIFI, travertine marble floors and baths, local artwork, all giving Casa Amor a beauty synonymous with Mexico! Large rooms will allow Casa Amor's guests plenty of room and comfort. Play cards in the evening or dine on the fine fresh fish sold at the local markets in the roomy dining room. Plenty of room for 5 or romantic for 2! Sparkling kitchen has a blender and plenty of Margarita glasses! Purified water system at every faucet, microwave, new stainless steel refrigerator with ice in the door, dishwasher and washer/dryer. Property Details: You will enjoy a newly elegant remodeled spacious living area, air conditioning in all rooms, marble floors and baths, large balcony, ceiling fans, washer & dryer, CD stereo surround sound system and IPOD dock and speakers on the balcony, games, DVD player with movies, Satellite TV with over 50 music channels, 2 flat screen TVs,WIFI, twice a week maid service and security . Building Details: The building has ample parking with security cameras, Bi-lingual front office staff during business hours, 24 hour security staff, large heated swimming pool with huge sundeck with lounge chairs, b-b-q gas grill, tables with umbrellas - all sitting right against the ocean. If you were any closer, you would get wet! The views are epic and I loved watching the pelicans dive into the water all day. Sitting on the balcony is so peaceful. WiFi spotty and doesn't work in all areas on the condo, if that matters to you. Traffic side bedroom loud at night from the highway. Highway side bedroom has a hallway light that you cannot block with the blinds. AC in that room sounds like a broken down car. WiFi didn't work in this room. Oven and stove is dated. Oven difficult to work because it's so old the labels have been rubbed away and it's a guessing game as to which burner or the oven you're turning on. Kitchen utensils are dated and knives are not sharp. Can be difficult if you have children and need to cut a lot of fruits and veggies to prepare several meals a day for a family. The dishwasher and washer/dryer worked fine. Shower heads are old and crusty, only partial water flows out in both showers. Toilet flush handle broke while we were there. It was fixed upon request, which was appreciated. Like other reviewers have said, the couch and living area furniture could use updating. The cushions have holes in them. This place also has a maid cleaning service, but oddly it was scheduled for the day before we left, not in the middle of our 8 day stay. The shared area with lounge chairs and the pool area is nice and the pool is maintained well. I watched the staff clean the pool every day. The beach is lovely with lots of kids and families during the weekend. It's one of the nicer beaches for children to play. The security is friendly and present throughout the building. Cabs are easy to get outside. There was a pack n play provided for our baby, which was appreciated. In summary, while a lovely location, the actual condo is in need of a tune up. Happily, the phone company has now made Fiber Optic service available to our area and it will be installed into the condo in June. This should help with the service. To explain a bit, the condo has been occupied steadily during high season and repairs are scheduled as soon as there is a break. I rely on helpful comments to keep the condo in the best condition possible. We pride ourselves in immediately taking care of any problems you may incounter while there. Dull knives and calcium build up on shower heads are easy fixes and we would have been pleased to help you have a more pleasant stay, had you told me. As far as the range, you were having difficulties lighting the range and I walked you through it on the phone, although there are instructions in the condo. The range didn’t have markers on it when it was purchased, believe it or not, not because it is old. I have scheduled to have the sofa recovered and I will send out someone to check the A/C to see the problem. Again, thank you. Punta Negra is a special place and am please you enjoyed the view. The condo itself is also very nice and a very good value even though it wasn’t up to your standards. I will attend to items you mentioned immediately. We loved the views from this condo and how close it was to the ocean. Getting to the pool was quick and easy (as was going back up for lunch or liquid refreshments.) The beach is beautiful and quiet and we swam in the ocean several times. If you want to be in the hub of the action, this is not the place for you as it's a 10 minute cab ride to the Romantic Zone. However, we prefer peace and quiet and are happy to head downtown when the mood strikes. This condo is an excellent value. Thank you, for your kind review! So true, this is not the place for spring breakers wishing to party at the clubs. We are so pleased you enjoyed your time in Vallarta and hope to see you again soon! My partner and I were very happy with our stay. The view is amazing and the condo is as it looks in the profile. The front desk staff are wonderfully friendly and helpful. All the appliances worked well and we like that the bus stop to town was right across the street. The only drawback is that the mattresses in both bedrooms are incredibly hard and uncomfortable. We found it difficult to have a good nights sleep because of this. Overall though a great place. Sorry for the delay in replying. Thank you so much for your feedback. We have installed memory foam matress tops on both beds in hopes that guests will find the beds more comfortable. I appreciate your stay and your kind review! We loved the location of this property, only 10 min drive to do downtown and one of the best beaches in the area. The Condo staff were very friendly and spoke good English. Our kids loved the pool and play in the Ocean that was only steps away from the back of the property. The owner was lovely and amazing to work with too!! As for the condo itself, the good: great space and layout, it made it very convenient to have laundry in the unit. Good kitchen and necessary utensils. The need for updates: The living Room couch is a bit run down and could use replacing but it’s functional. This I know Is a personal preference; if you like a very firm bed then you will sleep well, if you are like me who prefers some softness to their mattress you may find it difficult to sleep. If you plan to cook, you may want to assess your needs for basic kitchen spices. We had to purchase salt and a few other basics, not a big deal. The waves being at your back door is Amazing, but can be loud, I brought ear plugs and that worked really well. Overall great location and time with our family. I am so happy you enjoyed yourselves! It really is a beautiful spot. Thank you for the heads up on the sofa. It is a top of the line rattan sofa and i replaced all of the cushions last year. I will definitely check it and see if it needs repairs or replacement. It is the upmost importance to us that the condo is in top condition and well maintained. Thank you for your stay! ***edit to tell you due to your feedback concerning the beds, we installed memory foam matress toppers on both beds. We hope this will make the beds more comfortable! Quiet, beautiful, but wish it could have been longer! Nice unit in Puenta Negra. Clean, comfortable, everything working-TV, internet, frig, etc. Friendly staff and security. Plenty of buses, taxis, and now Uber. Wonderful south coast as usual. Thanks Susan and Jesus. This part of Puerto Vallarta is perfect for families. It is right on the beach and away from town but with easy access to teansportation. The building and condo are kept up very nicely and the building staff and owners of the unit are super friendly and can help with anything you need. Puerto Vallarta is a magical town with cobblestone streets... majestic mountains... intimate villages, beautiful waters and beaches. This lively, yet quaint resort area lies on the northern coast of Mexico's Riveria, where the temperature rarely varies from a comfortable 85 degrees. Playful whales are abundant in Banderas Bay from December through April. 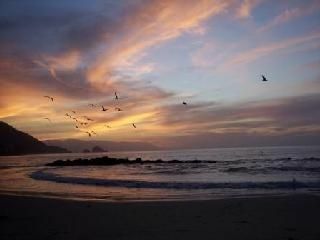 Ever growing in popularity among sun seekers worldwide, Puerto Vallarta offers exceptional nightlife and some of the most wonderful watersports & views in all of Mexico, yet still remains it's old-world charm.